Mount Holyoke College chair of astronomy Darby Dyar’s mission? Include her students in exploring Mars and planetary science. Offer experiences—as undergrads—that prepare them to further their scientific studies. And give them the confidence to launch exciting careers. Dyar is part of a team examining and analyzing data gathered from Mars probe Curiosity’s ChemCam. 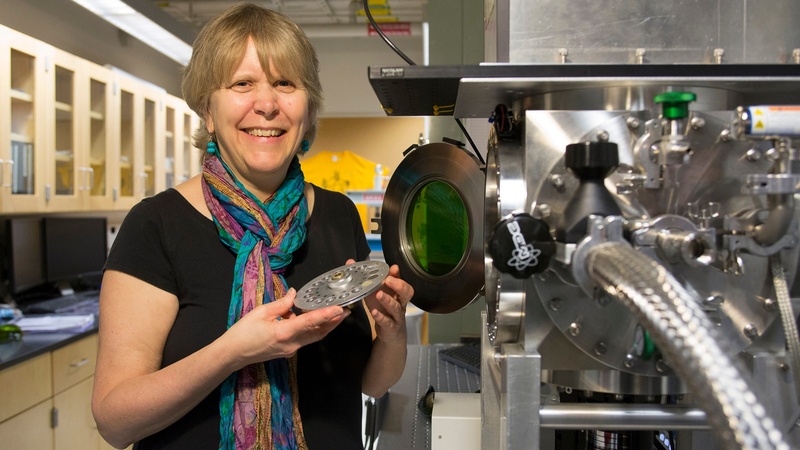 In her Mount Holyoke lab, she and her students create fake rocks using spectroscopy to learn how the minerals respond to different conditions. This initiative will “benefit the field of planetary science for years to come,” says Dyar. Dyar, who has taught at Mount Holyoke College since 1998, has mentored hundreds of students over her career, both within and outside of her department. She recently won the G. K. Gilbert Award, a rarified award from the Geological Society of America, in recognition of her contributions to the field of planetary geology. Watch this clip to see one of Mount Holyoke’s many rock stars—in action.